Dr. Pierce has been with Delaware Valley OB/GYN since completing his residency at Albert Einstein Medical Center in Philadelphia. Besides caring for patients in general obstetrics and gynecology, Dr. Pierce has a several specialized areas of interest. He was one of the first two gynecologists in Mercer County to perform DaVinci robotic surgery and is now one of the most experienced gynecologic robotic surgeons in the area. He played an active role in the development of the robotics program at the University Medical Center at Princeton and has mentored other surgeons getting started with DaVinci surgery. At the hospital, Dr. Pierce has also served on the Process Improvement Committee and as chairman of the perinatal committee in the department of Obstetrics and Gynecology. He also maintains an interest in the treatment of sexual dysfunction. 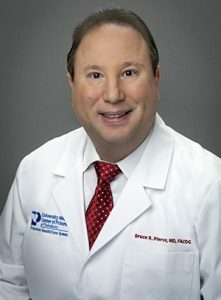 Dr. Pierce sees patients at our Lawrenceville and East Windsor offices, and performs surgeries and deliveries at Princeton.